Slow down the aging process, strengthen your body & your immune system, increase vitality, reduce depression and anxiety through monuments and visualizations. Beginners welcome. Open to the public. This is a strength-building class. We will focus on maintaining and gaining stability and power in the arms, legs and core, through both sitting and standing exercises and 8 -12 minutes of aerobic movement. All exercises can be participated in form a seated position on a chair. Great music! Special needs and challenges welcome. We work the whole body in a fun way, with a little chickee, chickee, chickee and a boom, boom, boom! Class focuses on stretching, strengthening, lengthening, flexibility, eye hand coordination and balance from a standing or seated position. We also practice fall prevention and recovery from a fall. All students 18 and over are welcome. seated form of mindfulness training which is beneficial for relaxation and stress reduction. Class includes instruction and modifications for all ability levels. 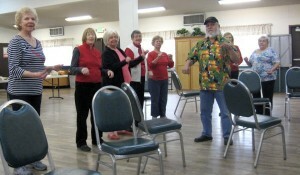 Students are taught the Tai Chi for Arthritis Form. Drop in students are welcome at any time. Optional DVD available from instructor. In this class we are studying an ancient Chi Kung Form from the Nam Hoa Temple called Longevity Tree. This form consist of a series of movements representing aspects of nature and our connection to it. 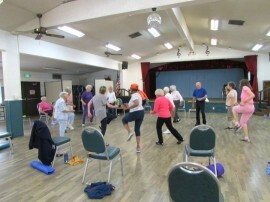 The class also contains a Chi Kung warm up section and a seated mindfulness practice. Drop-ins are welcome. This class is especially for beginning students who have never studied Tai Chi, although all levels are welcome. We will be learning the first half of "Yang Application Form." 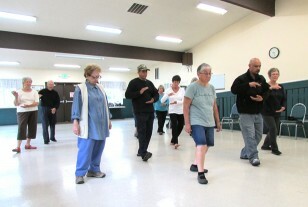 The class also includes a Chi Kung warm-up section and a seated mindfulness practice. In this class we are focusing on deepening and strengthening our "Yang Application" practice. Class also includes warm-ups and seated mindfulness practice. Join us for alternative yoga "stretch" routine that enable you to experience the real benefits of yoga without stress and strain. We use chairs blocks and straps to ease into streching. I have been teaching yoga for nearly 20 years and helped people with physical limitations or injuries.